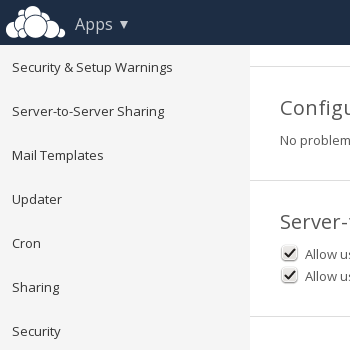 What is coming in ownCloud Server 8.0 for system administrators? The ownCloud Server 8.0 release is getting very close! Many changes will impact developers and users but we have not forgotten system administrators. If you run an ownCloud server or consider setting one up, read on to find out what is coming for you in ownCloud 8! Making ownCloud easier and faster to administer has been an important focus for this release. The administration and settings interfaces have gotten a new sidebar for more quickly accessing configuration settings. As part of this, the App installation, upgrading and removal has been improved as well. Thanks to the changes in the layout, it is easier to find enabled or disabled apps. Third party apps available for installation from the app store now show ratings and are sorted by them. 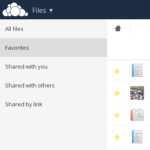 Newer versions of ownCloud often come in through the ownCloud Updater app. This app has become more intelligent, including a greater ability to detects errors in the upgrade process before they happen and rolling back the changes, additional status messages provide better feedback, and error messages provide insight into any errors that may block an upgrade. User management has gotten an overhaul. In addition to the existing filter and text string searchable user management, an entirely new set of features has been added to ownCloud. Admins can now edit email addresses for system users, sort users, select multiple users at once, rename groups and more – making it easier than ever to manage an ownCloud system in operation. 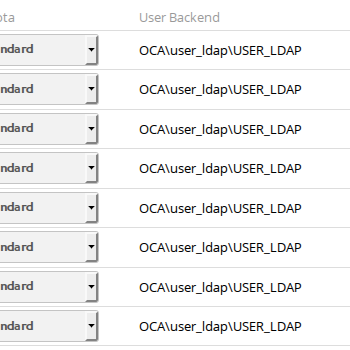 Integrating with LDAP and AD directories for user management is one of the most critical capabilities required for a file sync and share solutions. 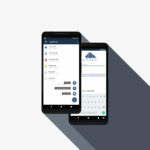 ownCloud has significantly improved LDAP and AD performance, provided additional configuration options and expert modes, and added a new utility for verifying and removing users from ownCloud that are no longer active in LDAP or AD, making it easier to maintain ownCloud in the enterprise. For many administrators, remotely managing ownCloud users is a core part of managing the overall enterprise file sync and share system. The provisioning API, that has been limited to the Enterprise Edition, is now available to the community as an open source app, providing these same system administration benefits to the overall ownCloud community. System administrators should take note that PHP 5.4 is now required for ownCloud Server 8.0. This allowed the ownCloud developers to take advantage of newer features and performance improvements in this new PHP, impacting performance and stability of ownCloud positively. If you like to keep an eye on ownCloud development, consider reading our regular development reports. ownCloud is currently in testing phase and if you’re interested in helping out consult our testing documentation. 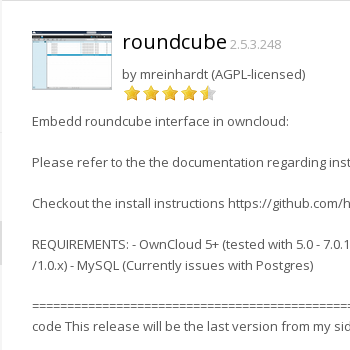 You can find daily builds of the upcoming ownCloud Server 8.0 release on the bottom of our download page. All combined, while coming just 3 months after ownCloud 7, the new release brings a wide range of enhancements in all areas.